Social Media have been attracting significant attention thanks to their explosive growth all over the world. Figures suggest that well in excess of 1 billion people around the globe already use social networks, and that millions more join them every week. Facebook and China’s QZone report more than half a billion users each. Even more startlingly, reports suggest that the time spent on Facebook alone each month is approaching 1 trillion minutes – an astounding 62,000 years worth of sharing photos, commenting on walls, and ‘Liking’ videos, every single day. With such huge audience potential, it’s easy to understand why companies are rushing to establish a social media presence of their own. However, effective use of social networks entails much more than creating a Facebook page or Twitter account for your brand – especially if you hope to see a meaningful return on your investment. The current excitement surrounding digital social media might suggest that they are a recent phenomenon, but their roots go back more than 30 years. As early as the late 1970s, systems like Usenets and Bulletin Board Systems (BBSes) paved the way for the kind of online interaction that lies at the heart of today’s social networks. In the second half of the 1990s, the rapid growth of the Web fueled interest in ‘cyber communities’, and the first recognisable social networking service – Six Degrees – launched in 1997. However, the launch of Friendster in 2002 is widely recognised as the birth of the social networking model we’ve become familiar with today, and although its popularity has waned in recent years, Friendster is seen as the primary influence for platforms like MySpace and Facebook . Relatively speaking, social networks are still very much in their infancy though, and the recent launch of Google Plus demonstrates many still believe they offer huge potential. So what can social media do for your brand? Before we explore how to use social media for business, it’s important to clarify a few common misconceptions. It’s unlikely that social media will actually replace anything; rather, they’re simply one more – albeit very powerful – addition to the array of channel options at the marketer’s disposal. Sadly, this is a long way from the truth; while the media space itself may be considerably cheaper than it is in newspapers or TV, the time involved in creating effective social marketing means social channels still require substantial financial investment. A number of researchers have reported this to be the case, but there are plenty of case studies to suggest that, when done properly, people even welcome branded activity in social media. The caveat to this is that social marketing must offer real value to its audiences, and not adopt the interruptive model we’ve become used to in mass-media advertising. There are no set rules for social media marketing, and even the most admired practitioners are still learning what works best. 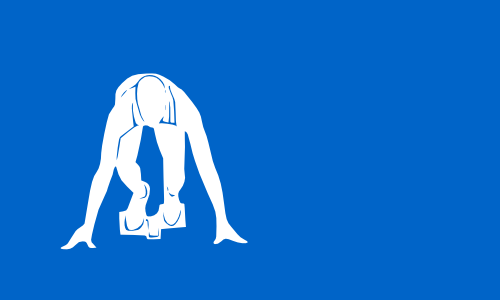 However, the following guiding principles will help you get started. Before you can develop a social marketing strategy, you need to know what you hope to achieve. 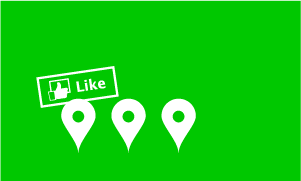 Will you use social media simply to deliver advertising? What about customer service? 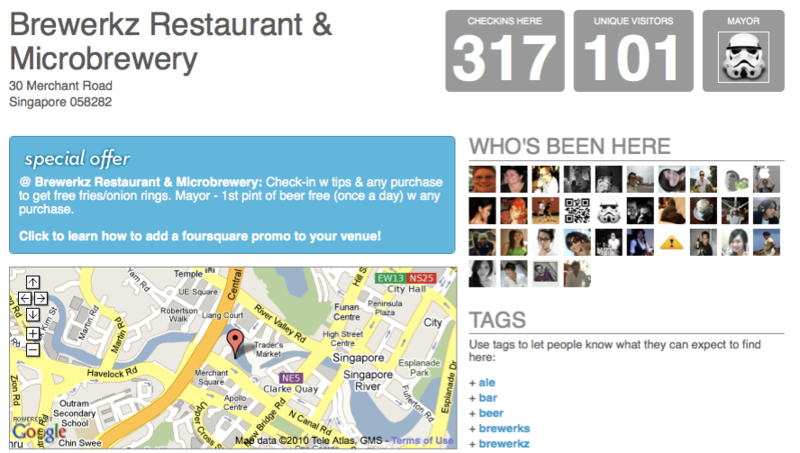 Do you expect your social activities to generate revenue? Critically, you need to identify social marketing’s role within your broader business strategy, and how it will complement and build on other activities. Ultimately, social media are simply means to an end; their popularity lies in the fact that they help us to interact with other people. Consequently, users gravitate towards those platforms that help them do this best, and if a superior alternative appears, people are quick to change their behaviour (remember Second Life?). One key factor of long-term success in social marketing is to develop a strategy that is flexible enough to adapt to new platforms and behaviours as they become meaningful parts of your audience’s world. It’s also vital to remember that most people use social networks to socialise, so it’s vital for brands to adapt their approach to suit the channel. Critically, brands can’t act in the self-centred ways that often characterise conventional advertising. Brands are merely guests in social media, and even in situations where they are the guests of honour, they still need to behave with some degree of humility and social grace. Above all, they need to appear natural – anything cold or forced is will stand out as being very awkward next to heartfelt conversations between friends. The average social network user has connections to hundreds of people, organisations, and brands. As a result, their ‘social stream’ is full of different content, much of which has been shared by family and close friends. Consequently, it’s very difficult for brands to capture people’s attention; unlike the interruptive paradigm of TV advertising, social marketing must compete with videos of unbelievably cute kittens, photos of last weekend’s party, hot celebrity gossip, and countless conversations about everything in between. The only way to ensure your brand doesn’t get lost is to make sure everything you do adds real value to your audience’s world. This involves building activities around what your audience cares about; not around what you want to sell. Historically, marketers have used advertising as a way to introduce their brands, products, and services – in many ways, advertising is the business equivalent of a chat-up line. Over the years, these chat-up lines have become ever more elaborate, but one key challenge has remained: how to evolve a series of disjointed one-liners (campaigns) into a lasting relationship. Social media makes this evolution much easier, offering marketers a way to include two-way communication within their marketing mix. 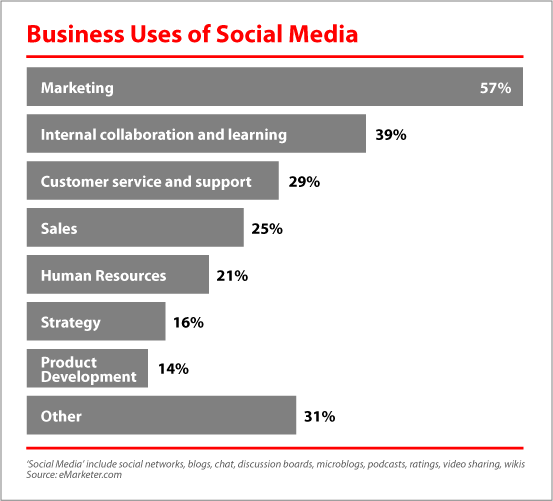 In so doing, social media allow marketers to establish a regular exchange of mutual value. The ‘value’ the brand offers can take many forms – entertainment, information, rewards, etc. – but it’s the conversations that this content inspires that deliver the majority of the value back to the marketer. By understanding what their audiences want, need and like, marketers can better tailor their approach – indeed, social channels can be used to deliver highly effective R&D, market research, and customer service, all at the same time. What’s more, brands aren’t restricted to direct conversations with their audiences either; with the help of today’s online monitoring tools, marketers can also track other public conversations about their brands, and identify new ways to deliver incremental value. The old adage states that you can’t please all of the people all of the time, and nowhere is this more evident than in social media. Although the kinds of conversation we see in social media are nothing new, social platforms allow people to have them on a much greater scale. Some brands have already witnessed what happens when things go wrong in social media, but it’s likely that we’ll see many more examples of brands being called out by disgruntled consumers in social media. It’s worth noting that such situations can arise regardless of whether your brand participates actively in social media or not. Given this, it’s likely that, sooner or later, something, somewhere will go wrong, so it’s well worth preparing for such an eventuality in advance. One of the greatest limitations of traditional advertising is that it can be very difficult and costly to change campaigns that fail to deliver what the advertiser intended, especially where media must be paid in advance. The conventional broadcast reality is ‘ready, aim, fire’, and if the shot is wide of the target, you need to start again. Social media work quite differently, offering marketers real-time control over their communication activities. Critically, the interactive nature of the channel means that we can stop, start, or change different elements very quickly, depending on the audience response (or lack thereof). No, you’ll just have to wait. It’s a game of give and take. For most brands, ‘success’ in social media takes time. It takes a significant amount of effort and commitment to build lively, enduring communities, and marketers can’t dip in and out as they might do with conventional advertising. As in most relationships, though, social media is more about a journey than a destination. While it’s vital to have clear objectives before you set out, the things you learn along the way will inevitably influence where you get to, and it’s worth allowing yourself the flexibility to adapt to new and unexpected opportunities as they arise. These principles should help you begin to formulate your brand’s social media strategy, but there’s no substitute for experience. Fortunately, social channels are well suited to a ‘test-and-learn’ approach, where you can constantly evolve and refine your activities based on interactions with your audiences and the results they deliver. Once you’ve developed the core of your strategy, try it out on a small scale, with a particular focus on watching, listening, and learning; you’ll quickly identify what works for your brand, and what you’d prefer to avoid repeating. 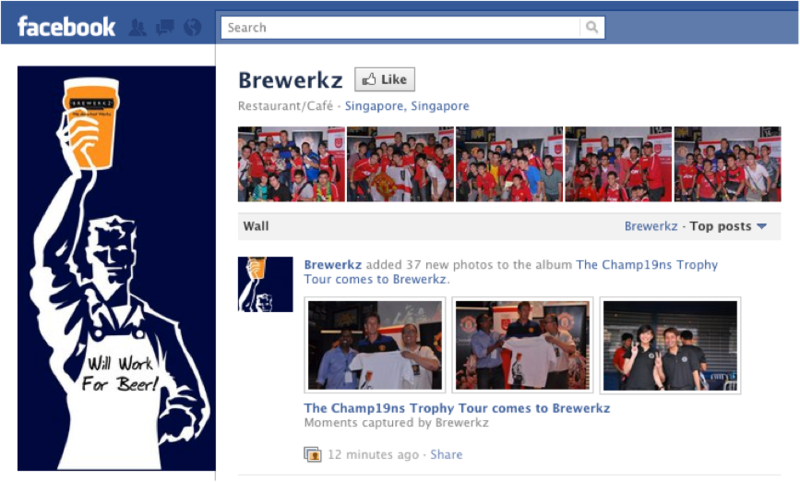 Popular Singapore bar, Brewerkz uses a wide variety of simple but effective social media activities to drive business at its outlets, proving that even brands with small budgets can make great use of social media. What tips would you offer businesses about to start out in social media? Why not share them in the comments. 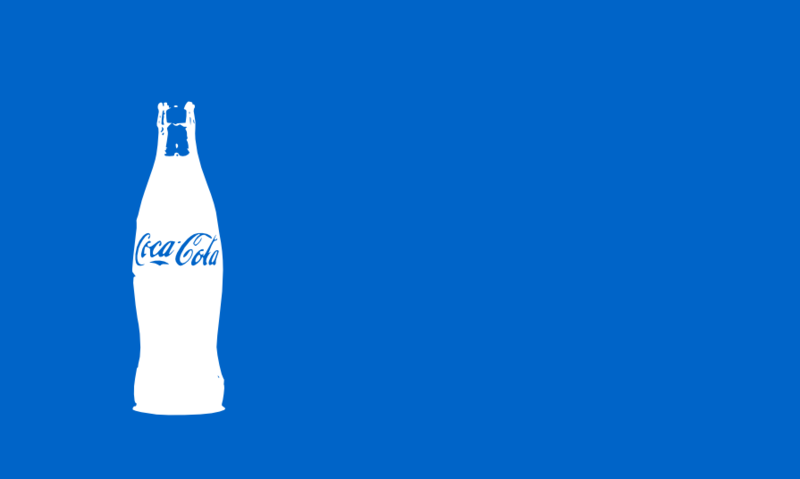 It’s widely known in marketing circles that Coca-Cola’s Facebook page was originally created by two ardent fans who had no official ties to the company. I was always impressed that Coke brought these fans in to help them run the page, rather than simply taking control of the property and relieving the creators of their legacy. However, on a chance visit to the brand’s Facebook page yesterday, I noticed that the brand has decided to tell the whole world that story too – and they’ve done a really good job of it too. 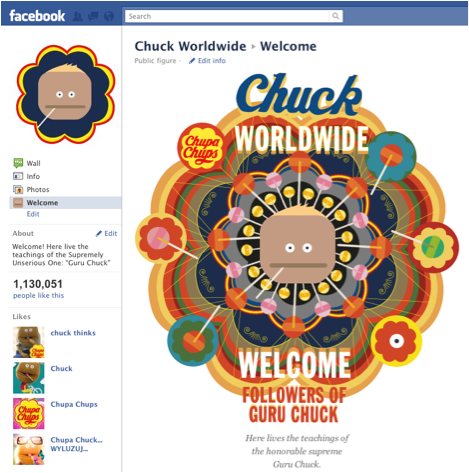 Apart from the fact that the tab is a great example of how to design a Facebook tab – a simple, appealing layout with a variety of content types – there are a number of things that make this an excellent case study in social marketing. Firstly, the tab celebrates fans. This is central to any successful branded community, but Coca-Cola have taken this to a whole new level. Its real magic is in the message it sends – we celebrate fans who share their love of Coca-Cola. It’s the perfect incentive for other fans to go out and create pages and communities of their own, furthering the brand’s impact and deepening its social resonance. 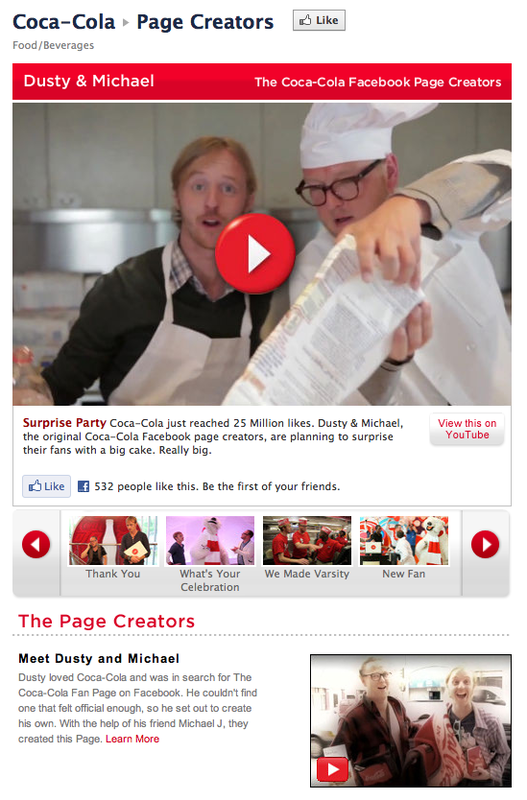 It’s even led to the creation of a separate ‘Dusty and Michael’ fanpage. Secondly, it tells an enduring story. This tab is not a ‘campaign’; the Creators tab appears to be an on-going project that evolves naturally. That’s an excellent way to ensure the brand continues to have interesting content for its page that people will actually engage with. The story element is tightly interwoven with the tab’s third strength: it’s human. Good social media marketing is always about the people. Sure, Dusty and Michael are now social media ‘celebrities’ in their own right, but they’re still people that the average fan can relate to. More importantly, to the page’s other fans, Dusty and Michael are now ‘real’ people with whom they can develop some kind of relationship. That means there are even more opportunities for people to engage in dialogue with the brand. In other words, it’s now even more social. And that’s what changes a page into a community. What do you think? What else makes it such a strong example of social media marketing? They’re both Places that I’ve previously checked into, so it’s likely I’d have an opinion on the question. I’m interested to see what Facebook are going to do with this – will they start to publish rankings of the most popular places by city? 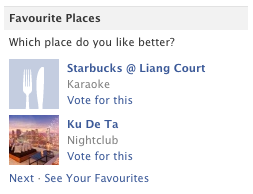 Or will they perhaps start to recommend places based on my network’s favourite places? Whatever the plan, it looks like it has plenty of social potential.